Adobo (Spanish: marinade, sauce, or seasoning) is the immersion of raw food in a stock (or sauce) composed variously of paprika, oregano, salt, garlic, and vinegar to preserve and enhance its flavor. In Filipino cuisine, adobo refers to a common cooking process indigenous to the Philippines.When the Spanish first explored the Philippines in the late 16th century, they encountered a cooking process that involved stewing with vinegar. The Spanish referred to it as adobo due to its superficial similarity to the Spanish adobo. The Filipino adobo is an entirely separate method of preparing food and is distinct from the Spanish marinade. 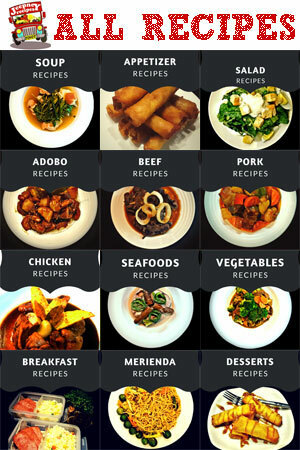 Filipino Adobo has so many variants and it differs from region to region. Also, aside from Chicken and Pork Adobo other ingredients can also be used like squid, beef, lamb, other exotic ingredients (like rabbit, snake, frog and bugs) and some vegetables like sitaw (string beans) and kangkong (water spinach). 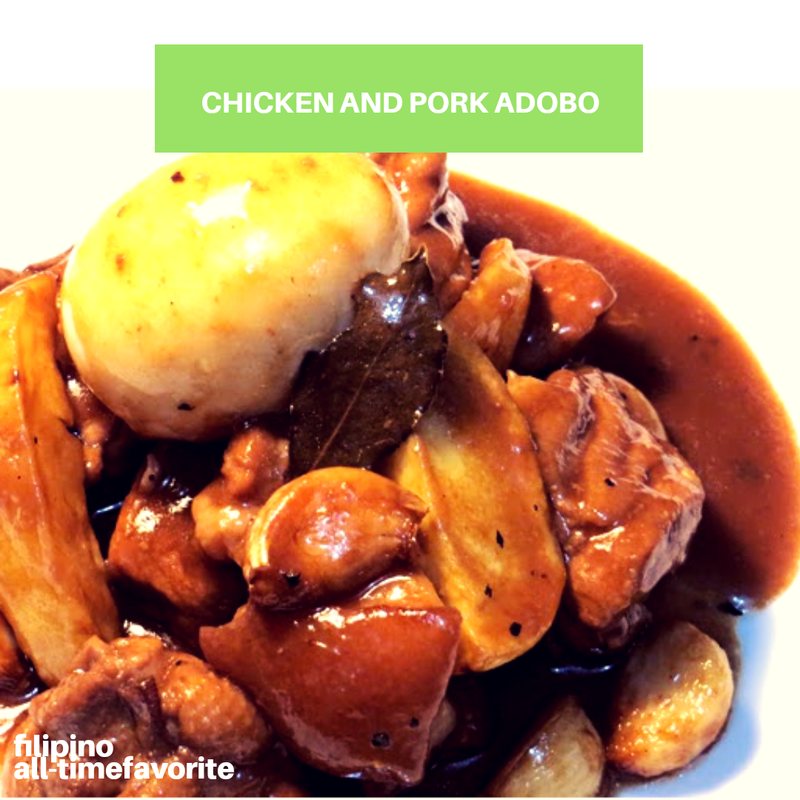 Today, I'm going to share you my own version of adobo, although it is the same chicken and pork adobo recipe that you may know, but the way i cook it is not. This is the kind of adobo that my 4 year old son loves so much. For a picky eater like him, to eat a lot is a miracle. Once the oil becomes hot, fry the garlic and the potatoes. Cook until the color turns golden brown. Remove the garlic and the potatoes, set aside. With the same pan, totally remove the oil. Add pork and chicken. Cook for 5 minutes or until the color turns light brown. Add all the other ingredients except for the vinegar, fried garlic and potatoes. Cover. Let boil and simmer until the meats are tender or until most of the liquid evaporates. Now add the vinegar and simmer for another 5 minutes. Do not cover! Add salt to taste. Put-in the fried garlic and potatoes, stir, and cook for 2 minutes. If you want the sauce to become reach and thick, just mix 2 tbsp. of cornstarch/flour and 1/2 cup of water. Pour it slowly to chicken pork adobo while stirring continuously over low fire. The thickness of the adobo sauce still depends on you. If you are a typical filipino who likes his adobo recipe sweet, just add more brown sugar according to your taste.